The exterior of the Department of Justice building in Washington, DC. The Department of Justice has unsealed indictments against eight persons allegedly behind two separate massive digital advertising scams, 3ve and the charmingly named Methbot, the Verge reported on Tuesday. According to a DOJ press release, six of the defendants were identified as Russian nationals (one held dual Russian-Ukrainian status), while the remaining two were from Kazakhstan. 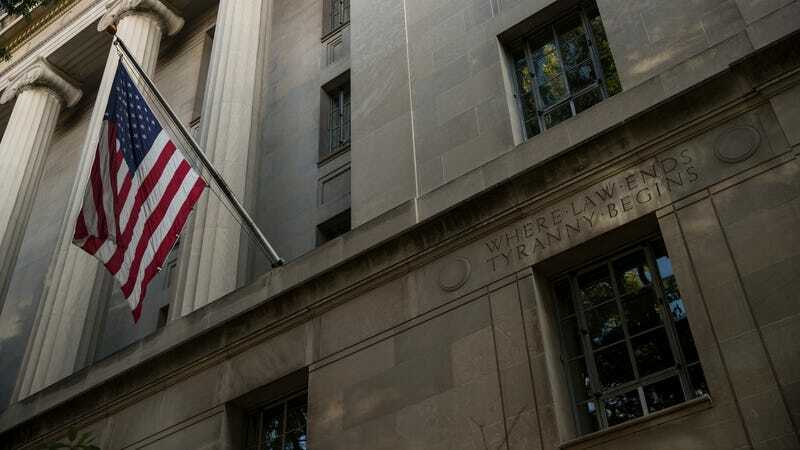 The DOJ said they recently arrested Kazakh nationals Sergey Ovsyannikov and Yevgeniy Timchenko in Malaysia and Estonia respectively, as well as Russian national Aleksandr Zhukov in Bulgaria, all of whom are awaiting extradition. Five other suspects—Boris Timokhin, Mikhail Andreev, Denis Avdeev, Dmitry Novikov, and Aleksandr Isaev—are still at large. Charges levied against them include wire fraud, computer intrusion, aggravated identity theft and money laundering, the DOJ wrote. Ovsyannikov was allegedly involved in both schemes. An infographic explaining the 3ve attacks posted by Google. The spoofed outlets include a who’s who of the web: video-laden sites like Fox News and CBS Sports, large news organizations like The New York Times and The Wall Street Journal, major content platforms like Facebook and Yahoo, and niche sites like Allrecipes.com and AccuWeather. Although the main targets were in the United States, news organizations in other countries were also affected. As the Verge noted, White Ops claimed Methbot could be bringing in $3 to $5 million a day, which may have been a bit of a stretch considering the (admittedly not exactly negligible) $7 million number cited by the DOJ. 3ve was much more successful, raking in an alleged $29 million. AdWeek pointed out that while prosecutors said Methbot shut down in December 2016, right around the time of White Ops’ disclosure, they said 3ve continued running until October 2018.